Description: In early February 1961, Albany newspaperman Duane La Fleche noted a wire service report about a group hoping to entice New York Philharmonic to make Stowe, Vermont its summer residence. La Fleche proposed that the group stay in New York and perform in Saratoga Springs. Local civic, cultural, and legislative leaders, who had previously considered a Saratoga Arts Center an interesting possibility, began to design the facility. Within a week, they held their first meeting; within a month they were focusing on Saratoga Spa State Park as the site, had won the support of State Conservation Commissioner Harold Wilm, and begun discussions with both the Philharmonic and New York City Ballet. 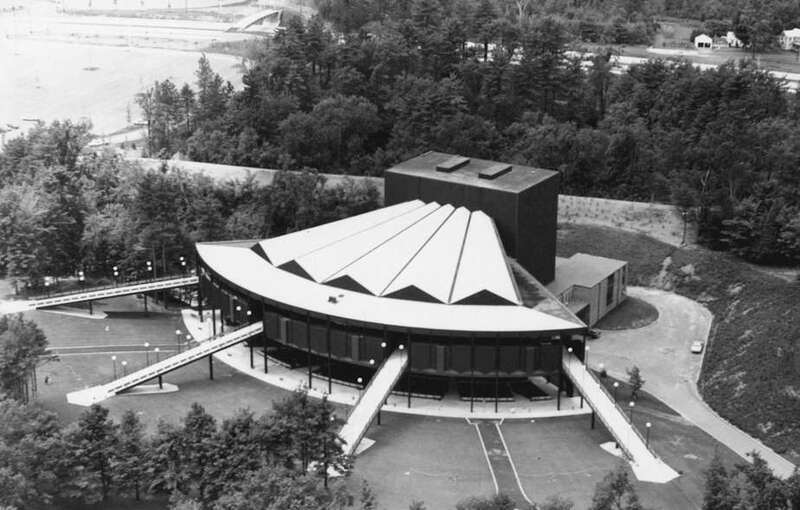 By summer 1963, generous contributions from Rockefeller Brothers Fund and New York State supplemented community support to create Saratoga Performing Arts Center. In June 1964, Governor Rockefeller mounted a bulldozer to break the first yard of ground. More than 410 workdays followed: 300 workers clocked 136,000 hours to complete the 5,100-seat, 10-story amphitheatre (original layout of the venue did not include a festival lawn). On July 9, 1966, NYCB conductor Robert Irving raised his baton, and Balanchine's A Midsummer Night's Dream enchanted the opening night audience. Ahh, SPAC, the eastern U.S. DMB promised land. These shows are always a treat. Finally going to make it there this year. Only 3.5 hours away, why not? you won't regret the decision. SPAC is simply incredible. SPAC should have a N3. Used Live Nation for N1; pulled absolute last row in the balcony. I hear that's not bad because you can watch the chaos on the lawn while soaking in a possible breeze. Got $75 reserved tickets for N2 through the Warehouse. Staying at the Best Western in Clifton Park, NY. I hear that's not bad because you can watch the chaos on the lawn while soaking in a possible breeze. I did N1 there in '13. It's definitely not bad and those are both true. Not that we wanted a breeze that year, but should be nice this year. There's basically another row behind the seats too if you want extra room. I got Section 5 off LN for N1 cause I went for a single. $85 reserved from WH for N2. Sadly, I think the time has passed for 3 nights at SPAC but I always wished they would. I also may have a pair for sale at some point. Got both nights, but can only make 1. Just have to decide which night we are going. Seats are "eh" from WH though. Will take whichever you decide to sell and can paypal right away. Just let me know! Find More Posts by .JJ. Looking to go for the first time this summer. Will be my only shows because I can't hit Mansfield. How are the crowds here? We're leaning towards the lawn (five people, two nights) because its cheaper, but we'd rather not be surrounded by drunk high schoolers either. I've never been to SPAC, but I'm sure that lawn will have plenty of drunks around you. I was on the lawn last year for VA beach, there were plenty of drunk high schoolers and adults all around us. We just moved further up till we found a sweet spot of people actually enjoying the show. Yes, there are drunk high schoolers on the SPAC lawn, but also some really cool fans as well. Last edited by skippy; 05-18-2015 at 12:06 PM. Anyone have a pair of night ones inside they want to sell me? Please! Anyone have any advice on driving/parking, etc? First timer here. Looking for someone who might have an extra hotel reservation! email me at [Only registered users can see links.] if you happen to magically have one!